I love any excuse to sit and paint. Using acrylics, watercolors or oils doesn’t matter, it is the relaxing task that makes me happy. With the left over boards from my still-in-progress plank flooring, I’ve begun to paint beach signs. I bought an inexpensive 4″ pack of letters and numbers to use as templates. Home Depot has a wonderful selection of sea inspired spray paints to choose from for painting the boards. I chose a light aqua shade for my front door sign, “Beach Bums Welcome”. By adding the small dolphin, crab and swirls, I think I captured the essence of living on the gulf coast. Remember to spray paint the sides as well as the plank of wood for the best sign. Glass beads from the Dollar Tree. 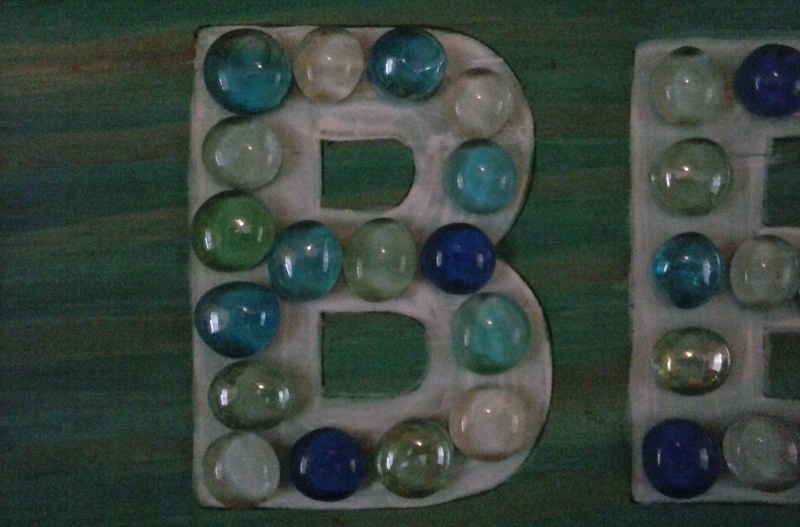 In the “BEACH” sign, I used large 6″ block letters I found at the Michael’s Store on sale. Using the letters as a template I outlined BEACH and painted the letters with acrylic paint thinned with a small amount of water. 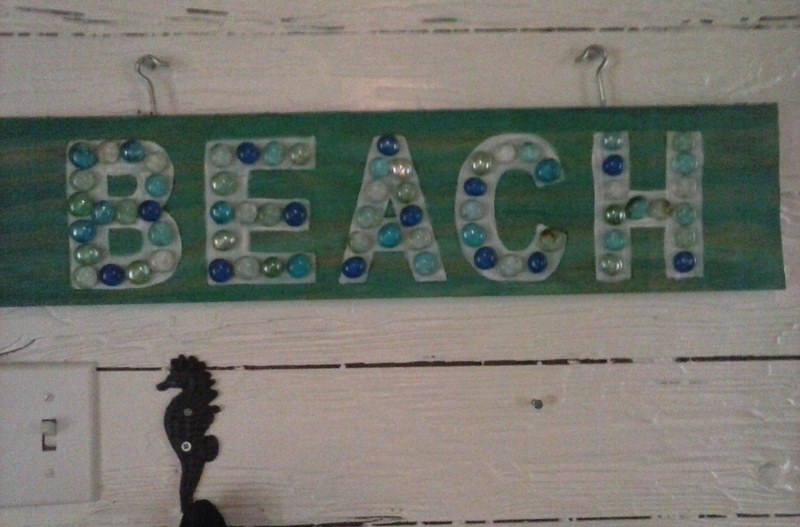 I love bling on my beach signs! I used a darker background color of aqua with acrylic paint and water to leave the pattern of the wood intact. The BEACH letters were painted white in the same manner. This give a rustic feel to the sign. Next I added inexpensive beads found at the Dollar Tree in blues and greens. To hang a heavy beach sign I use screw in hooks and put screws into the wall. Since my walls are shiplap (tongue and groove wood) I can hang anything I want, heavy or not. If you have drywall, find a stud to screw into before hanging. Have fun with your project and let me know if you have any questions or want to share your own experience with beach signs. 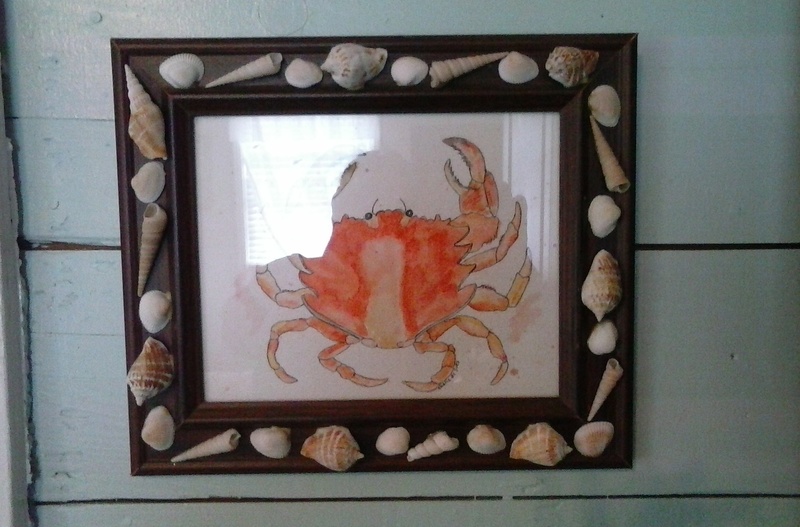 I love days when I can create frames for the watercolors I paint of the beach, fish, crabs, well you get the idea. 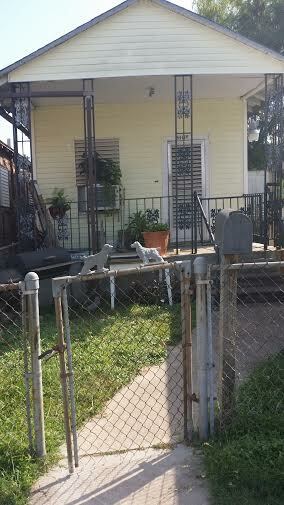 My first fun task is to stop by the three thrift shops in Galveston that carry used frames. Goodwill on the island is a great place to find any size and shape you desire, but choices are different in somebody else’s home town. 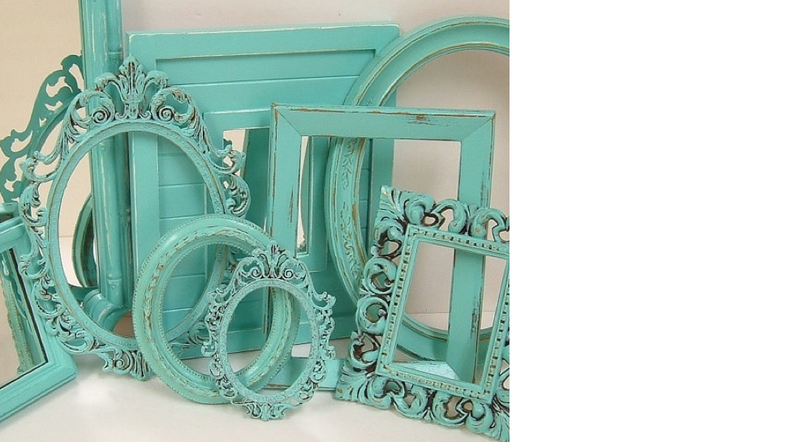 Find amazing frames at your local thrift store. I usually pick up multiple and hopefully matching sets of 5 x 7, 8 x 10, 11 x 14 and higher. A big score is when I find 3 or 4 of the exact same frame to create sets. When I get home it’s time to clean the glass with cleaner and prepare each frame for painting. Separate all the pieces and with a erasable marker put “A” on the first group of parts, “B” on the next, etc. You don’t want to get the pieces mixed up because one piece of glass doesn’t always fit the same sized frame. I put newspaper on a table outside with tape when there is wind or not. Place the frames that will receive the same color on the newspaper and spray paint your color on. Do 2 coats with 1/2 hour dry time. Remember to flip them over and get the sides. Now spray on a sealer like polyurethane or whatever is cheapest in the store. I have no problem buying new frames at deep discounts, like 50% to 75%. You can get matching sets this way. Once your frames are ready and dry you need to gather some supplies. Glue gun or plastic glue bottle is fine with brush, seashells, sand, pearls, scissors, rope, colored glass beads and anything nautical or beachy is great. Now you’re going to add your precious beach finds onto the frames. I like to keep things balanced, so I try to create a pattern. One of these, one of these, and three of these, repeat. Kids love these projects and I suggest giving them one frame each, sand, small shells and glue. Don’t forget to take pictures because you’ll be laughing and want to remember this day. So here are some finished projects, some are mine and some are friends who blog about wedding décor and art projects for home. Rope is very nautical and can be feminine with seashells with a touch of pearlescent glitter. 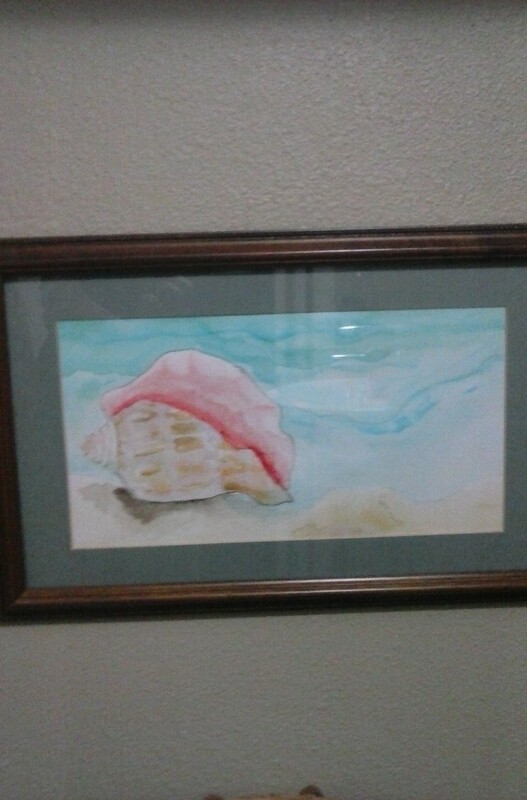 Get your beach framed art noticed with seashells. 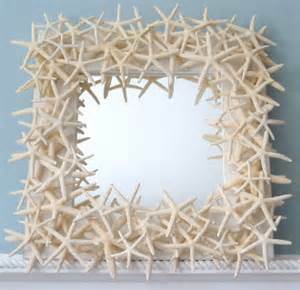 Now starfish like this white finger starfish mirror can be pricey to purchase and laborious to find on the beach. So I found a great solution or should I say recipe for creating salt-dough finger starfish. The greatest part of this budget conscious idea is the food dye you can add to the recipe. Can you say blue finger starfish? 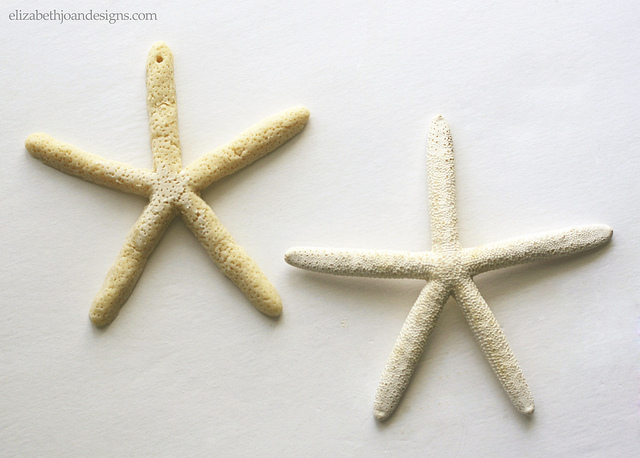 With a little paint or dye, this salt dough starfish is a budget friendly project. How about this pic of treasures from the sea? 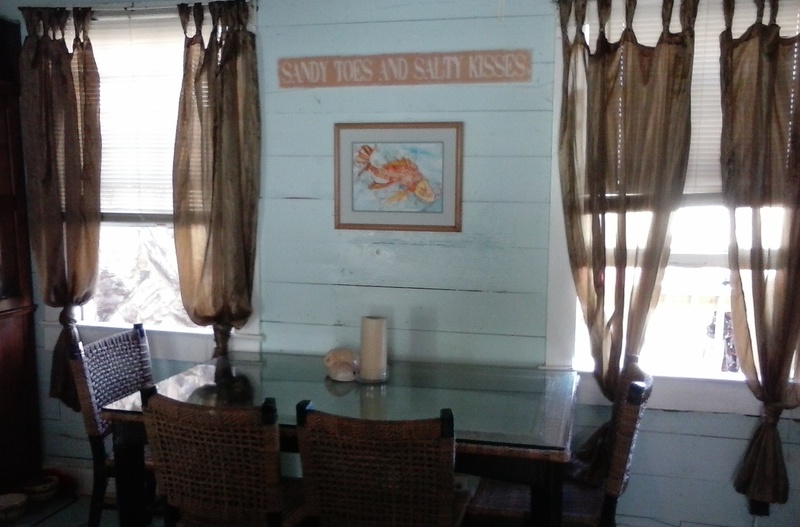 Not a frame, but a nice addition to framed art walls to get some ocean themed shells and blues into the room. 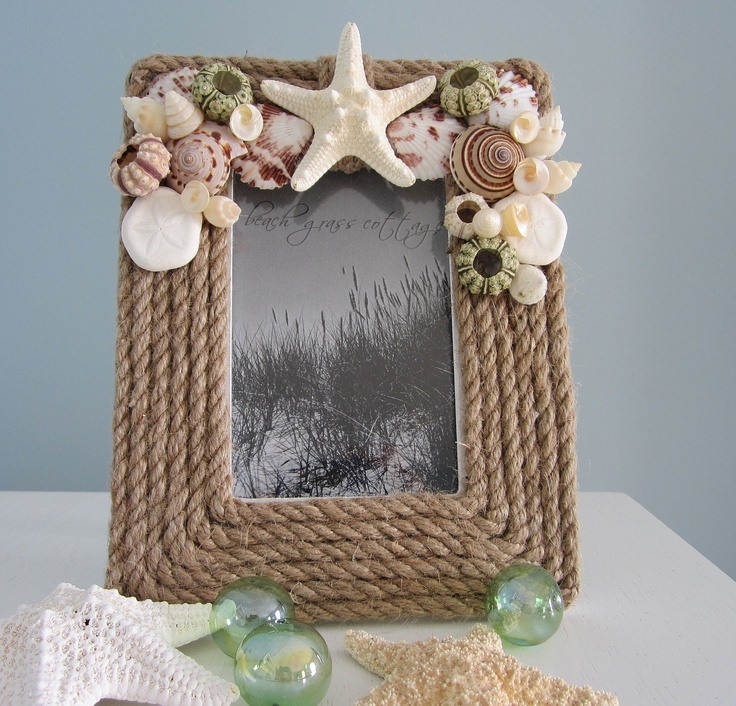 An easy way to add beach décor with shells in a framed grouping. I can hear you now…”I can’t paint, I can’t draw, I can’t do this project.” NONSENSE, of course you can watercolor. This art form has been around since the dawn of woman. Really. Remember all those cave art paintings with blood, dye and charcoal? Well, that was the beginnings of watercolors. I wasn’t always interested in art, in fact I was more interested in chasing after my little boy at the time. I had a full time job, went to college part time and a single mom with a three year old. I was busy, busy, busy. Now I have the time to sketch seashells and paint with swirls of peach and blue. The art is budget friendly. All you need is a small, medium and large brush, watercolor paper, a palette of watercolors and a glass of clean water. The whole thing may cost about $20-$30 dollars. Voila! You are an artist! When you get the urge to try your hand at a watercolor, allow about an hour for the project. Start with 8″ by 10″ watercolor paper taped to a flat surface that will get wet. Draw, trace, stencil or copy an image that speaks to you, then use a pencil as an outline. These watercolors shown took very little time and the frames were purchased at thrift stores for pennies. 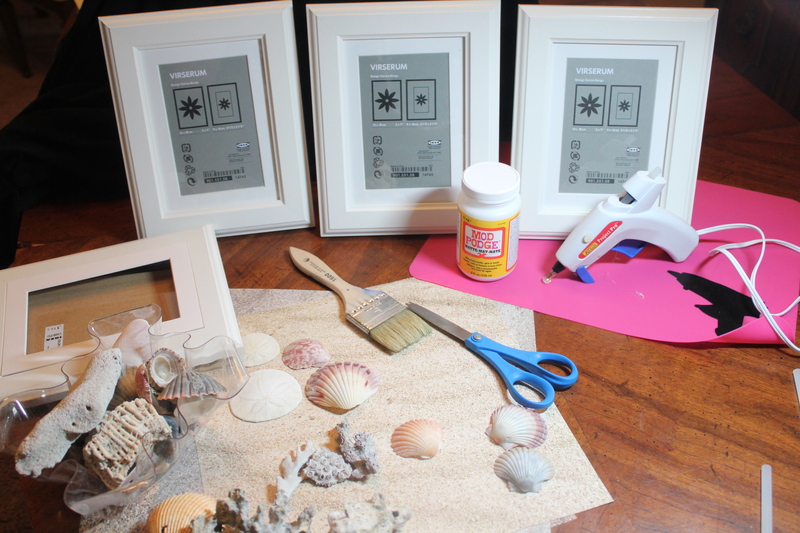 Get rid of the original artwork and paint or embellish the frames with seaglass, shells, sand with glue or dollar store pebbles. 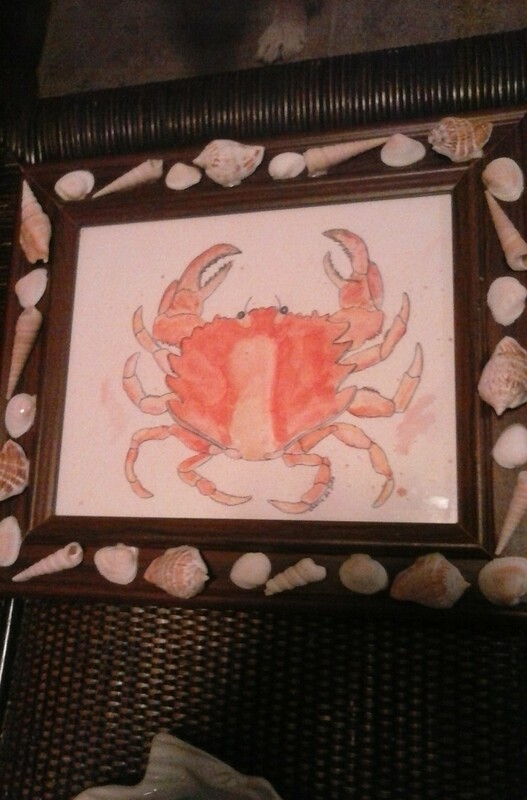 I hope you see how easy this art is to do on a rainy day with your beach treasures surrounding you to place on the frames. So here is a watercolor that is hanging in my home above the dining table. If you touch the pic it gets a bit larger. Happy painting. I love the look and smell of fresh cotton linens. 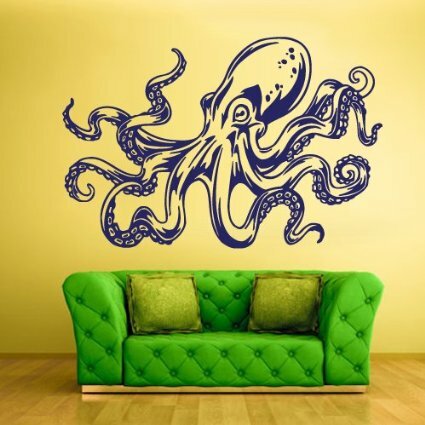 So what could be better than to add stencils that represent ocean sea creatures? 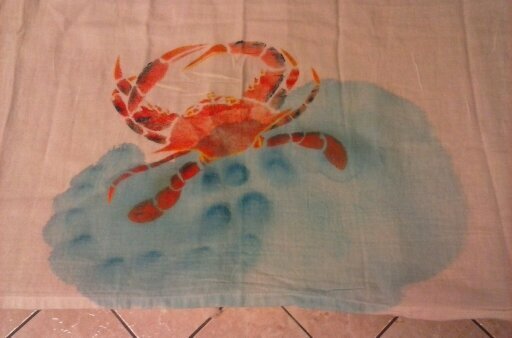 Living on an island there is no question that I choose crabs, coral or seahorse to embellish my linens. I stencil with a sponge, latex or fabric paint and I get this look with a pack of bar towels. When I hang the towel, the blue crabs are visible and oh so cute in my kitchen. As a watercolor artist I tried so experimentation with paint and a brush to come up with a more frame-able look. The crab was orange-red this time with blue water. Remember, this crab is a stencil I purchased from Etsy. I bought many stencils to make my towels more of a set than all original artwork. The towels are thin and I believe they were $5 at Walmart for eight cotton bar towels. The terry cloth towels with give you a kind of Monet look. What I mean is that when you stand back you can see the crab clearly, but up close there will be missed spots where the paint didn’t hold. 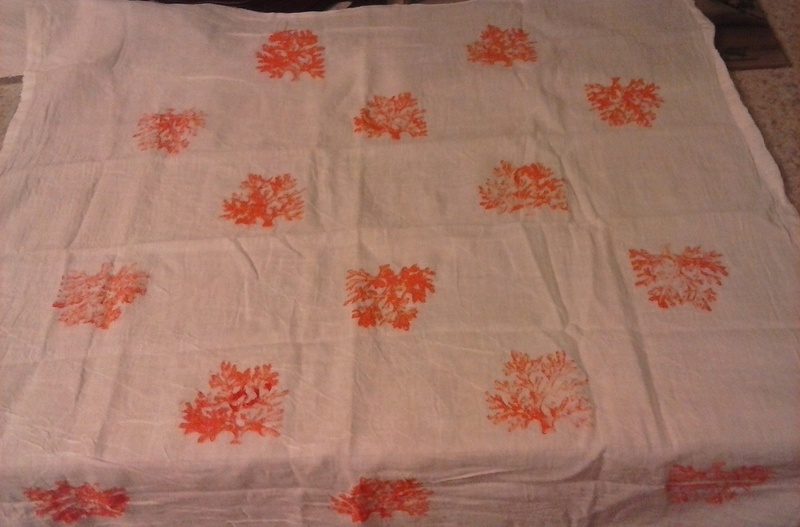 Here’s another pic where I put the same coral stencil over the entire towel. I hope you like the results. 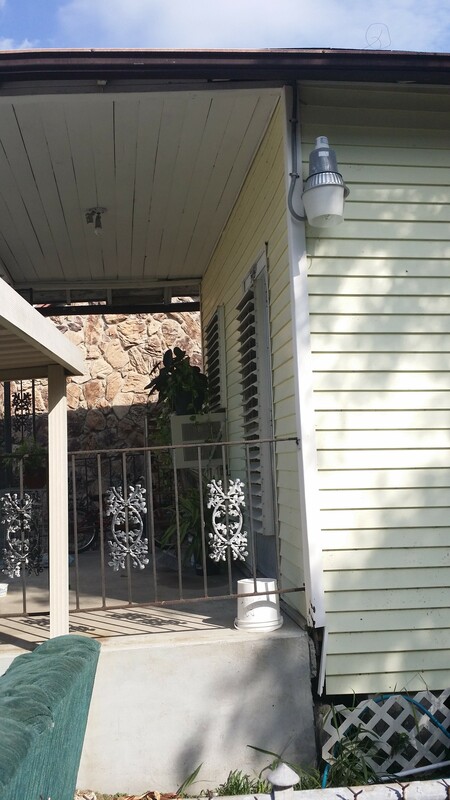 This project took little time and money. Very budget friendly. My hint is to lay the towels out overnight on a chair back to dry. Wash them on gentle the first time and see how they do. I haven’t had a problem and they seem soft enough for me. 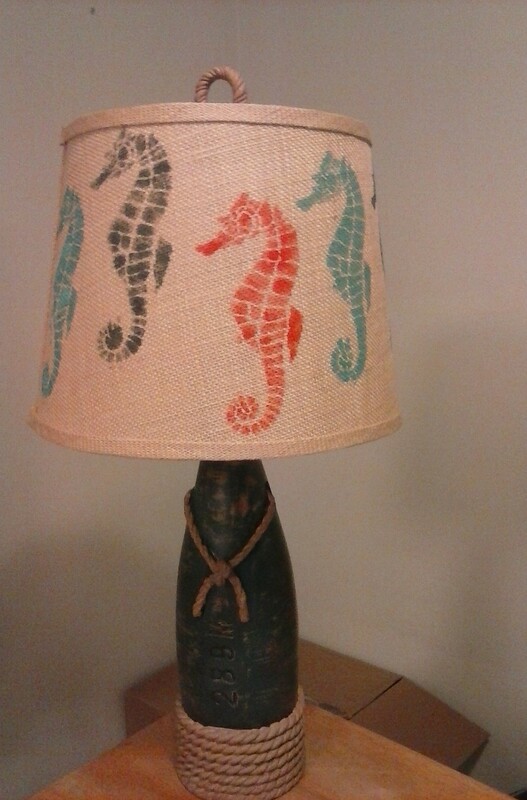 Of course I didn’t just stencil towels…um, I tried my hand on a burlap lampshade too. Er…um, I’ll let you decide if it’s a keeper or not. As a footnote, I did replace this lampshade with a new burlap drum. But if you have children I think this would be a great look. What do you think?